A social drama with thriller elements, Lakeview Terrace builds up good momentum in exploring race, mourning, jealousy and morality from a slightly different angle. 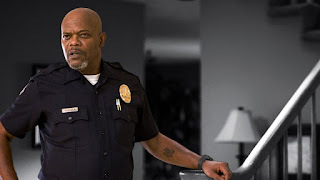 Abel Turner (Samuel L. Jackson) is an uncompromising veteran black Los Angeles police officer. He is nearing retirement and has never progressed beyond patrol duties in the city's worst neighbourhoods. Abel lost his wife a few years back, and is trying to raise two kids on his own using strict discipline in place of parenting. He has also installed multiple motion-activated security lights on his house and takes it upon himself to patrol his multi-ethnic middle class Lakeview Terrace community and judge the neighbours' activities. Interracial married couple Chris and Lisa Mattson (Patrick Wilson and Kerry Washington) move into the house next door to Abel. Happily in love and excited about owning their first place, their relationship is also carrying hidden strains. Abel takes an immediate dislike to his new neighbours, and in return they find him creepy and unwelcoming. Chris and Lisa will try to mend fences with their neighbour, but Abel is not an easy man to get along with. Directed by Neil LaBute and inspired by a real incident, Lakeview Terrace generates and maintains a potent current of menace. The film's unsettling energy stems from the relatively unique character of Abel Turner, played with understated relish by Samuel L. Jackson. All of Abel's actions and mannerisms are just slightly off, and the script (by David Loughery and Howard Korder) delves into a man starting to unravel at the edges and goes looking for the reasons why. Through snippets of his life away from the manicured suburban lawns, Abel's layers of frustration and anger seep to the surface. He never progressed beyond a patrol officer dealing with the scum of Los Angeles. His policing methods have descended to borderline abuse, internal affairs are on his case and he is being prodded into retirement. He has transported his obsession with crime prevention to his neighbourhood and fortified his house as if it's on the front lines. And on the home front Abel never got past the trauma of losing his wife. Chris and Lisa arrive to disrupt Abel's rentrenched life, at the same time as a fire on the horizon threatens neighbourhood tranquility. At least superficially, Chris and Lisa's love, happiness, public displays of affection and positive outlook represent everything Abel no longer has. It does not help that Lisa is black, and the white Chris enjoying the love of a black woman is too much privilege for Abel to take. He sets about poking away at their vulnerabilities to drive them away. The final act is where Lakeview Terrace stumbles, as the story heads towards cheap thriller territory and LaBute is unable to find a more cerebral resolution to the conflict in suburbia. It's an unfortunate let down, because most of the film is a welcome intrusion into what goes on behind the finely trimmed foliage.